Please read the listing carefully, I will not do a refund because you thought it was a completed doll, This is a kit, a kit is the unpainted vinyl doll parts only. 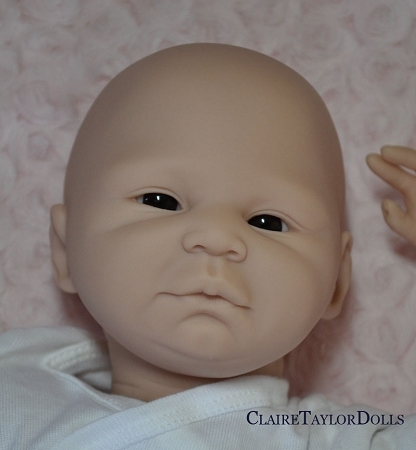 This is a kit, an unpainted vinyl kit for reborn artists to make a doll. 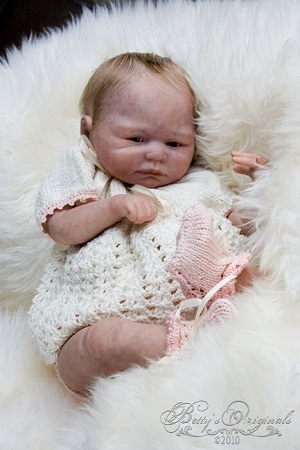 This is a kit, blank vinyl kit for reborn artists to make a doll. The kits are $79 plus shipping and will include the vinyl parts and a cloth body. Jessie uses size 18mm eyes, not included. These kits include a custom made body full legs and ¾ arms which allow them to be easily dressed; a finished kit is 18-19" and newborn baby clothing fits well. I sculpted this doll and had it reproduced in vinyl as kits for adult reborners. Jessie ia not intended as a child's toy, but as a collectible reborn kit. The kits are made from 100% soft Phthalate free vinyl. This vinyl is very soft, and smooth to the touch and easy to paint. The vinyl color is a natural skin tone which provides a wonderful base for achieving a lifelike skin. When rooting the hair on this vinyl, I found I did not have to warm the vinyl, the needle went in smoothly.